Who is eligible to play in the CCYL? For softball, players must be current residents of Charles County, St. Mary’s County, Calvert County or Prince Georges County, Maryland. What ages are eligible to participate in CCYL programs? Players age 4-18 are eligable to participate. League age for baseball is the player’s age on April 30th of the current year. League age for softball is the player’s age on December 31st of the previous year. Please see age cahrts under each division dropdown on the website. Bambino Buddy ball players may be age 5 - 105. Your registration fee covers team uniform, insurance, field usage and equipment. The registration for 10U and older divisions also covers umpire fees. What exactly are the Value Cards? Each player receives 5 value cards with their registration. The cards give you discounts for various Charles County businesses. If you'd like, you can sell them for $10 each making a profit of up to $50. This will help offset the cost of registration. If you prefer not to sell them, you can give them free to family and friends. Registration can be done online or at one of our in-person registrations. To register online, sign in or create a new account. What is required at registration? Players new to CCYL must show a copy of a birth certificate and proof of residency. Payment is due at the time of registration for all players. How do I volunteer to manage, coach or help? Managers, coaches and team parents can register online at our website. Please log in or create a new account. All volunteers who will be in the dugout or on the field must complete a background check and sexual predator training. More information on this will be availble soon. How do I become a league corporate sponsor? Softball T-Ball, T-Ball, 8U Softball and Rookie (8U Baseball) teams are usually formed based on geography in order to reduce travel time. As players move from Beginner to Advanced and Rookie, they are usually kept on the same team. All other divisions are formed using a draft process. Can I request a team, coach, or manager for my child? CCYL has made every effort to ensure that teams are very comparable in talent level. The goal is to arrange teams that are competitive and chosen through a set, defined process. The number of members of CCYL and the policies do not make it possible to place players by request. The T-Ball, Rookie Baseball, Rookie Softball are the only exceptions to the placement policy since they are non-draftable. But there is still no guarantee requests will be granted. However, CCYL will do its best to accommodate. What equipment am I required to provide for my child? Each player should provide his or her own fielding glove. Cleats are optional, but recommended. It is alsoy recommended that players wear all necessary personal protective equipment such as an athletic supporter, cup, and fielder's mask. Helmets with face masks are required in all levels of softball. Helmets with masks are recommended for baseball however, they are required for all on-deck batters age 12 and under. Who is required to attend evaluations? All players new to 10U and above divisions are required to attend one evaluation session for that age division. When and where are player evaluations? Evaluations for the 10U and 12U age divisions for both Baseball and Softball are held at the College of Southern Maryland (CSM) in La Plata on one weekend in mid February. Evaluations for players age 13 and over are held at Laurel Springs Park one weekend in mid-March. Players must wear sneakers as no cleats are allowed on the gym floor. Players must bring a fielder's glove. Helmets and bats are optional, as CCYL will provide those. Every season is different, depending on the season start date. Normally for the 12 and under players, the regular season usually starts with practices in early March, Opening Day depends on the Easter break (usually the first or second Saturday in April), and the season runs through to the middle of June (usually coinciding with the end of the public school year). Additional game dates may be added if needed due to rain outs, etc. Typically an 8 week season. For 13 and over players, the regular season start date coincides with the High School Baseball and Softball regular season end date. Practices usually start in early April, Opening Day in early May, and end in late June/early July with additional games added if needed due to rain outs, etc. Typically a 7 week season. All-Star state tournament teams start tournament play in the beginning of July and could go until the end of August based on their success and tournament schedules. 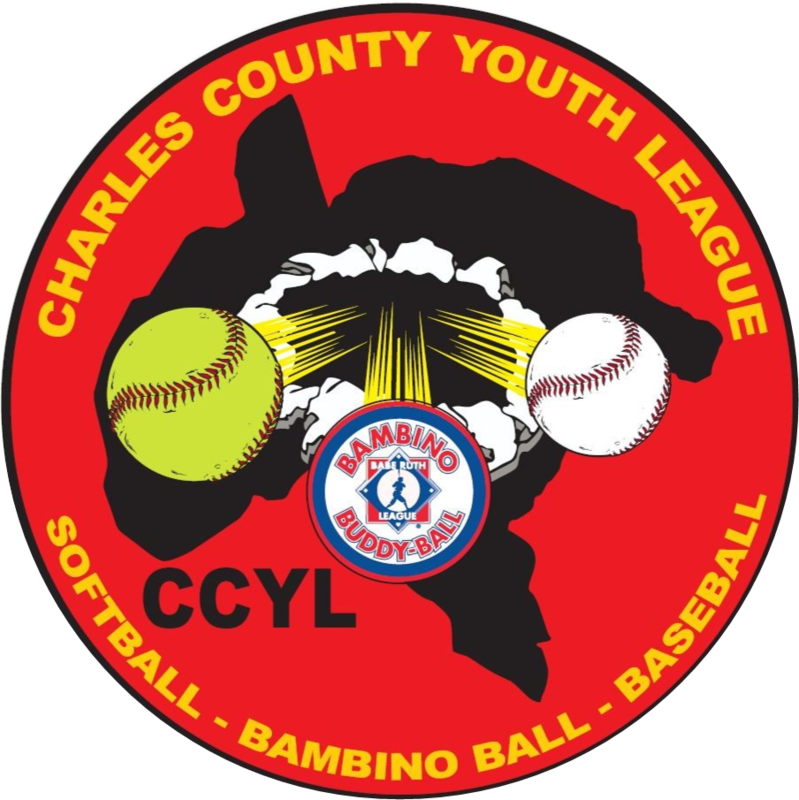 The location of games is determined by the field allocation that CCYL is given by Charles County Public Facilities. Locations can include Laurel Springs, Bensville, and local school fields. What are All-Star State Tournament Teams? Most age divisions of Cal Ripken Baseball, Babe Ruth Softball, and Babe Ruth Baseball offer tournaments to determine the Maryland State Champion in each age division. The State Champions can move on to the Regional Championship and maybe even to the National Championship. These tournaments are hosted at various locations for the various divisions. In the past, CCYL has fielded All-Star Tournament teams from Rookie up through the Babe Ruth leagues.